The Social Democratic Party of Germany (German: Sozialdemokratische Partei Deutschlands, SPD) is a social-democratic political party in Germany. The party is one of the two major contemporary political parties in Germany, along with the conservative CDU/CSU, and is led by Sigmar Gabriel. The SPD currently governs at the federal level in a so-called grand coalition with the Christian Democratic Union and the Christian Social Union since December 2013 following the results of the German Federal election of 2013. 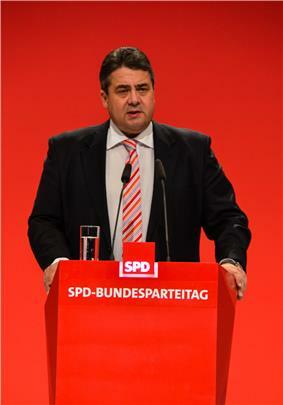 The party participates in 14 state governments, of which nine are governed by SPD Minister-Presidents. The SPD is a member of the Party of European Socialists and the Socialist International, and was a founding member of the Progressive Alliance on 22 May 2013. Established in 1863, the SPD is the oldest existent political party represented in German Parliament. It was also one of the first Marxist-influenced parties in the world. Despite the agreement of the Second International to oppose the First World War, the SPD voted in favor of war in 1914. In response to this and the Bolshevik Revolution, members of the left and of the far-left of the SPD formed alternative parties, first the Spartacus League, then the Independent Social Democratic Party of Germany and later the Communist Party of Germany. After 1918 the SPD played an important role in the political system of the Weimar Republic, although it took part in coalition governments only in few years (1918–1921, 1923, 1928–1930). Adolf Hitler prohibited the party in 1933 under the Enabling Act - some party officials were imprisoned, killed or went into exile. In exile, the party used the name Sopade. Between 1921 and 1923, right-wing militants carried out 350 assassinations of SPD political figures. The SPD is mostly composed of members belonging to either of the two main wings: Keynesian social democrats, and the Third Way, moderate social democrats belonging to the Seeheimer Kreis. While the moderate, Seeheimer Kreis social democrats strongly support the Agenda 2010 reformist programs introduced by former Chancellor Gerhard Schröder, the Keynesian social democrats continue to defend classical left-wing policies such as the expansion of the welfare state. The classical left-wing of the SPD claims that in recent years the welfare state has been curtailed through reform programs such as the Agenda 2010, Hartz IV and the more economic liberal stance of the SPD, which were endorsed by moderate social democrats. Geographically, much of the SPD's current-day support comes from large cities, especially of northern and western Germany and Berlin. The metropolitan area of the Ruhr Area, where coal mining and steel production were once the biggest sources of revenues, have provided a significant base for the SPD in the 20th century. In the state Free Hanseatic City of Bremen, made up of the cities of Bremen and Bremerhaven, the SPD has governed without interruption since 1949. In southern Germany, the SPD typically garners less support except in the largest cities. At the 2009 federal election, the party lost its only constituency in the entire state of Bavaria (in Munich). Small town and rural support comes especially from the traditionally Protestant areas of northern Germany and Brandenburg (with notable exceptions such as Western Pomerania where CDU leader Angela Merkel was re-elected in 2005) and a number of university towns. A striking example of the general pattern is the traditionally Catholic Emsland, where the Social Democrats generally gain a low percentage of votes, whereas the Reformed Protestant region of East Frisia directly to the north, with its strong traditional streak of anti-Catholism, is one of their strongest constituencies. Further south, the SPD also enjoys solid support in northern Hesse (Hans Eichel was mayor of Kassel, then Hesse's minister president, then finance minister in the Schröder administration, while Brigitte Zypries served as Justice Minister), parts of Palatinate (Kurt Beck was party leader until 7 September 2008), the Saarland (political home of one-time candidate for federal chancellor Oskar Lafontaine, defected from the SPD in 1999), and southwestern Baden (Marion Caspers-Merk, Gernot Erler). ^ "Sozialdemokratische Partei Deutschlands (SPD) - Parteiprofil". Bundeszentrale für politische Bildung. Retrieved 2014-08-21. ^ Merkel, Wolfgang; Alexander Petring; Christian Henkes; Christoph Egle (2008). Social Democracy in Power: the capacity to reform. London: Taylor & Francis. ^ Dimitri Almeida (27 April 2012). The Impact of European Integration on Political Parties: Beyond the Permissive Consensus. CRC Press. pp. 71–. ^ Ashley Lavelle (1 March 2013). The Death of Social Democracy: Political Consequences in the 21st Century. Ashgate Publishing, Ltd. pp. 7–. ^ William Manchester. The Arms Of Krupp. Little, Brown. 1968. 976 pgs. 300-330.